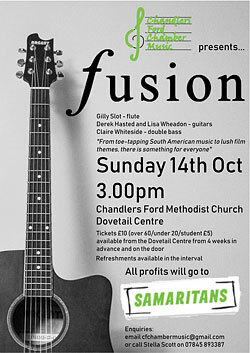 We played at the Dovetail Centre, Chandlers Ford on Sunday 14th October at 3pm, in aid of The Samaritans. Featuring flute, guitar, double bass and fleeting appearances by banjo and piano, this family-friendly concert had a large and very appreciative audience, and raised £225 for The Samaritans. Here's fusion playing "Time In A Bottle"